The What: The Red series of interfaces represents the pinnacle of Focusrite’s interface range, and Focusrite has launched Red 8Pre. With 64 inputs and 64 outputs (including a total of 16 analogue inputs and 18 analogue outputs) and eight of Focusrite’s specially developed, digitally controlled mic preamps, the Red 8Pre answers the need for more microphone inputs and a higher I/O count. 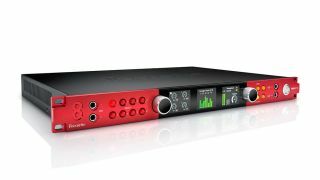 The What Else: In common with the Red 4Pre, the Red 8Pre includes two front-panel, high-headroom instrument inputs, dual Thunderbolt 2, dual Pro Tools | HD DigiLink, and Dante network audio connectivity. The eight specially developed “Red Evolution” mic pres in the Red 8Pre represent the evolution of Focusrite's premier mic pre design for the needs of today's recording environment. They are designed for clear audio performance with –129 dB EIN and 63dB of gain. Software control allows recall of settings and stereo linking, plus configuration of HPF, polarity invert, and individual phantom power. In addition, the preamps and other parameters can be adjusted from the front panel, with its clean multifunction controls and clear-color LCD displays. The preamps include Focusrite's “Air” effect, recreating in the analog domain the sound of the transformer-based mic preamps in the classic ISA range—for bringing out the breathy quality of a vocal or adding presence to an acoustic guitar. Red 8Pre also includes two high-headroom instrument inputs, instantly accessible from the front panel. The Red 8Pre's high-performance conversion system features what Focusrite calls “parallel path summing,” where two matched converters are run in parallel to increase the signal-to-noise ratio. They operate at up to 24-bit, 192 kHz sampling, with a dynamic range of 118dB (A-D)/121dB (D-A). Levels at the Red 8Pre's monitor outputs are adjusted via a digitally controlled analog attenuator. This allows them to deliver full dynamic range at all signal levels, rather than the conventional approach, using digital attenuation on the D-A, which is cheaper and offers slightly lower distortion, but means that bit-depth—and thus monitoring accuracy—is lost at lower levels. Like its smaller brother, the Red 8Pre delivers an array of connectivity options. Dual Thunderbolt 2 ports connect to a DAW, while at the same time allowing daisy-chaining of drives and displays. Round-trip latency as low as 1.67ms permits recording with preferred plug-ins in real-time and simplifies workflow—no need for cue-mix utilities or outboard DSP—while dual DigiLink ports connect the Red 8Pre directly to any Pro Tools | HD system. In addition, Red 8Pre features built-in Dante network audio connectivity. The dual ethernet ports connect any Dante-compatible product, such as units from Focusrite's own RedNet range, adding up to 32 channels I/O via ethernet exactly where they're needed with low latency. Furthermore, Focusrite Control allows the user to assign any physical input or output to any driver/Pro Tools | HD channel, allowing for easy customization of the interface layout and integration of hardware inserts. The Bottom Line: Featuring Focusrite's most advanced low-noise conversion and robust design, Focusrite's Red interfaces offer a balance of form and function, delivering the sound quality and versatility engineers and producers around the world expect from Focusrite.